It turns out that the fabulous straw bull-calf exists in real life, and not only in the national folk tale. 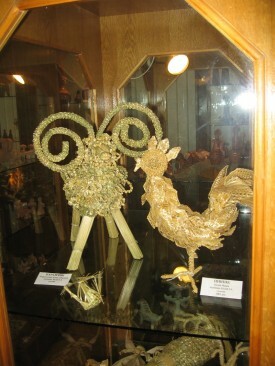 Beside the bull-calves, small horses, rams and angels appear from golden rye stems thanks to the crafty hands of the Kiev artist Iryna Billay. 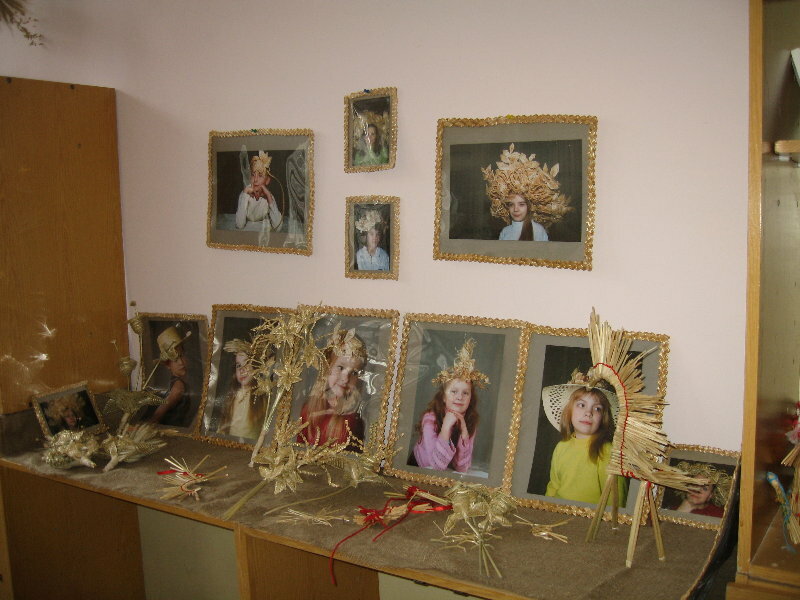 To see them I visited the National Ukrainian Center of Extracurricular School Education (in Kiev), where the artist has her own art studio devoted to the revival of national handicrafts and conducts master classes in straw weaving. 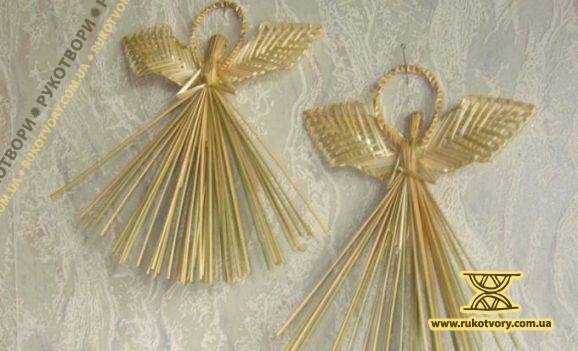 They say the works from straw have deep symbolic meaning and the hand-made amulets are effective indeed. Is it really so? I think it is so. 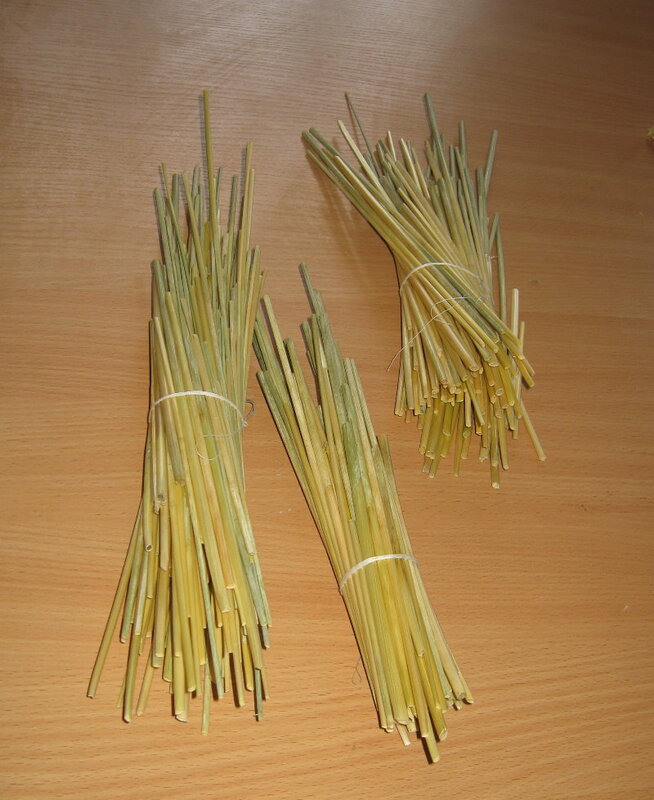 I’ve been weaving straw for approximately 14–15 years, though I am a teacher of mathematics by education. In the first place the straw itself is a special kind of material (rich in energy – auth.). We make everything from the rye. Rye is the symbol of life, so here you have the main symbolic meaning. Each component in the straw weaving means something. A circle is often present in our work and the circle implies the guard charm, the family, family tree, children, grandchildren and grand-grandchildren – the continuity of the family. In general, if to speak about the circle we should remember that in the old days one could go out of the house dressed only in a long undershirt but always with a belt because the belt meant a circle which protected and usually it had some signs or symbols embroidered on it. Embroidery was also obligatory around the collar… Why? Because some evil spirits could penetrate through the collar opening. People were just trying to protect themselves from the things they weren’t able to explain. It’s the same in the straw weaving… A horse is a symbol of luck and success. We wish: “For you to ride high”, we wish: “Success and let the good luck not leave you”. We often weave pyramids in our work and the pyramid means the entire universe and longevity. Everything is afraid of time and everything is afraid of pyramids. So the pyramid is a very good symbol. We make rams, they are toys and at the same time symbols of warmth, coziness and the small horns of these rams are the symbols of eternity. Often stars are present in our works – the same as Bethlehem star, the guiding star. Bells mean good news and guardian angels. Dwellings were often decorated by wreaths or bunches of flowers – the things belonging to the celebration of harvesting, and the last sheaf was placed in the honored corner. It is the symbol, too – the symbol of wealth and riches. To say nothing about the things which were obligatory in the houses. Each house had a didukh – a tree made of different cereal ears – as a symbol of wealth. (Laughs) Very complicated, indeed! Everything starts from sowing and then cropping with a sickle. It wouldn’t be hard for only one sheaf, but if it’s practically a full trailer — and that is what we have prepared this year… Because a lot of children work here and I like it when there is a store and everything is done on a large scale. This year the straw has been very high and beautiful so we’ve used the opportunity to prepare as much as to last us for the next year or two. Do you sow the rye yourself? It depends. This year I’ve done it because now I have my own plot of land – a dacha. In the past when I didn’t have any I used to make arrangements at different places. I want to thank the people who just came to me at some exhibition and offered to sow the rye for my needs. So those people grew all that rye for me I had been talking about earlier. And I wouldn’t say they have too much land, it’s just that they purposely laid out a piece of land for that. These people are among my best friends now. And I come to the conclusion that there are a lot of nice people everywhere. Have you sown much rye at your own dacha? … Not very much yet, but I was glad I would have the remainders from this year. Well, I will improve – next time I will sow wheat and oats beside the rye, I even have the seeds (laughs). I am getting prepared for this. And though I have never been engaged in this kind of farming yet I think I will manage it. So, it turns out that the things can be made from straw left of any kind of crops? Any kind of straw will do, even grass. 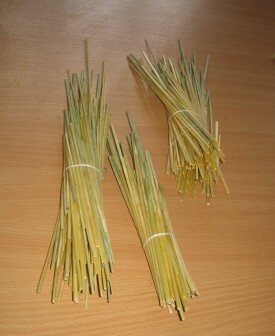 If there is a wish you can find lot of different materials for weaving, such as different water-growing and bog plants. With them a bit different techniques are used. Certainly, to use rye straw is the best because this plant is the highest and its stem is the longest. But there are a lot of items for which the length does not matter. For example we make small pyramids and they don’t need very long straws. Is the rye treated in some way before weaving? No, the most important thing here is to timely crop it. I’ve been working with it for many years and know that each year it is different though they are the same seeds that are sown. The result depends much on the natural conditions. The rye can be harder or softer and it depends completely on sun and rain. From your observations, what kind of weather is the best for rye? Rain and sun within reasonable limits. When the weather is too dry the rye doesn’t grow high. Are there any objects very difficult to make from straw or is it possible to make practically anything from it? To my mind there are no things too difficult to make, but to put it more precisely there are no things too easy to make either. Because each work presupposes a great number of components. For example recently we have made rams at the school of blind children, and rams are composed of four hundred elements. Can you imagine the process of making 400 elements? One can get bored in the process and want to finish it sooner and the most difficult moment when all these elements have to be neatly united into one item is still ahead. But in general I cannot say that it is difficult for me to make something because I love this and it is not difficult when with love. 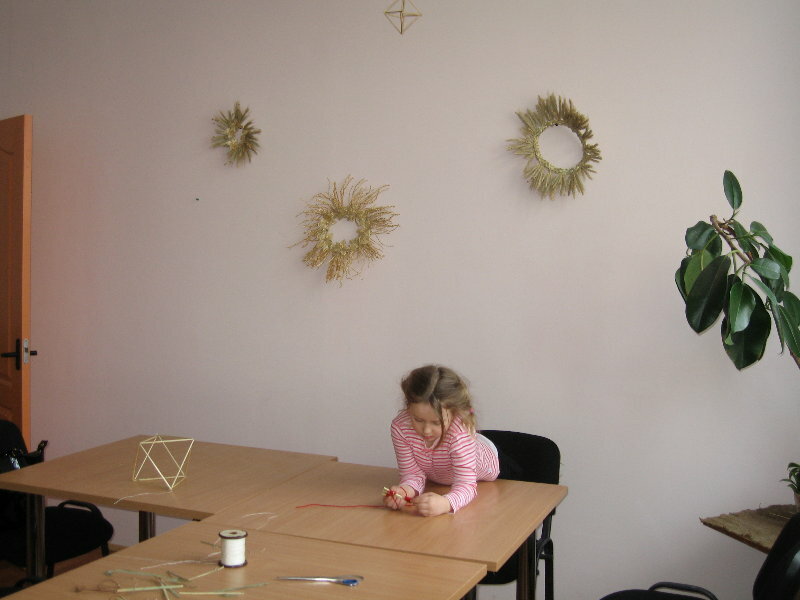 Would you tell us how you turned into the straw weaving artist from a teacher of mathematics? You know, with me it’s not a full transformation (laughs). I have been working in two fields of activities and during my entire life they have been interlacing only with different amounts of time consumption each – sometimes mathematics won and sometimes the decorative art did. 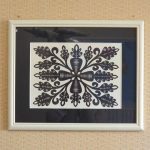 I used to take interest not only in straw weaving but also in other kinds of decorative art. — I don’t have this chest. At the time my husband worked in the regional communist party committee and once a delegation came to them so the chest was presented to that delegation. In short — there’s no chest. — Where can I find one then, Galino Mykhailivno, what do you think? — Well, maybe in the regional history and economy museum. I took a look at the chest and understood how everything was made. Because my father is very crafty and I, too, as they say “have hands”. The only thing I don’t remember about it is where I got the straw from… I made my first chest but I feel sorry now that I threw it away. And the first hat I made I gave away… so I don’t have my first works now, I haven’t saved them. 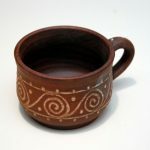 As far as I know you have an art studio called “Solomia” devoted to the revival of national handicrafts. What do you do during your lessons and who comes to them? I have two branches of my studio. I work in two companies, and in both of them the studio’s name is “Solomia”. 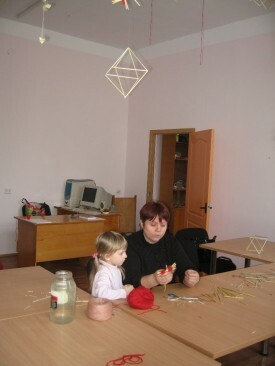 Here, in the National Ukrainian Center of Extracurricular School Education, I have groups of different ages. There are small children, students, adults, artists. To work with them is most interesting because they are my like-minded people, but they are not so disciplined when coming to the lessons and it is a minus (laughs). Because they are very busy. Beside that I work in the boarding school #5 for blind children. There are blind children and children with very bad sight. For me it is very interesting to work there as well though I was afraid to go to work at the place. By now I’ve been working at this school for a year and a half and I understand that one should not build any presumptions, a man can do absolutely anything if there is a strong with for it. 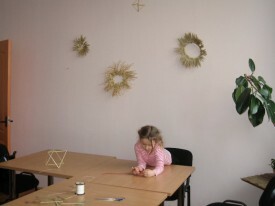 How do you think the straw weaving influences the upbringing of children? What are you working at now? Are you preparing for the May fair in Pyrohiv? Certainly! I am continuously making something. The only negative point here is I don’t have enough time. I think I would like to leave my job and to spend time only weaving. But I cannot afford it at present. And I think I would lose something as well because there is a very positive moment when working with children: I have a lot of ideas and even if I worked 24 hours a day I wouldn’t be able to implement all of them and with the children you always have someone to put your ideas into practice. And even in such a situation I don’t have time for everything and I have a lot of ideas left and a lot of thoughts to speak out. I am preparing compositions with bells and angels for the fair. And certainly I would like to make some fancy rooster, a ram, a horse. These works are very laborious so I don’t know yet what exactly I will make. You know the way I work: I prepare a lot of components and later within a week or two make something out of them. Those minutes are the sweetest to me when I create something using bags and bags of components. Is there someone else in your family who goes on for straw weaving? My daughter is weaving, too. But she is not deep into it because of her studies. All the same she is able to do everything and has her own techniques which are much better than mine I should confess. My daughter makes everything a different way and I like it. Do you cooperate with other artists? Certainly. I know several artists I respect very much. 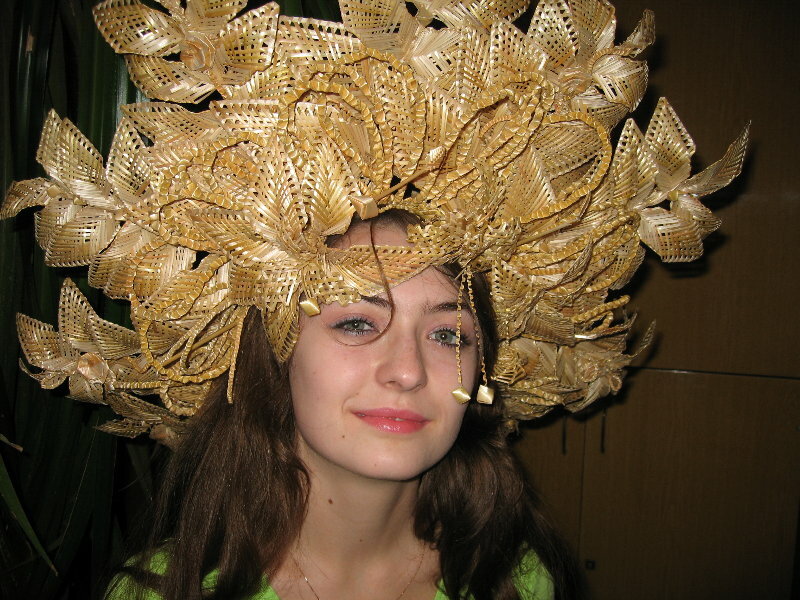 I can say I know all the artists in Ukraine who work in the field of straw weaving. I know some of them by the names and I am familiar with the others through their works. But the outstanding artists who have their own style are Maryika Kravchuk and me, to put it without false modesty. There are a lot of artists who just copy and repeat the patterns. It’s just good hands. So far I have not seen them ready to show something original of their own. In accordance to which criteria do you evaluate the cost of your works? Yet people buy the straw works? What is the tendency you see? Can your works be bought only directly from you? It happens wholesalers buy my works. 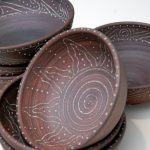 But I don’t have time to make so many items as to supply somewhere to be sold. And I don’t have a shop or salon of my own though I dream about having it. I want people to be able to come there and learn, that is I would conduct some master classes, meetings, exhibitions and fairs. I have a dream and think it will come true. Because I used to have a dream to organize a museum of Ukrainian folk decorative art. I can’t say I have organized it yet but I have already bought a house in a Pishky village at the border between Kiev and Cherkassy regions and now I am decorating it in the Ukrainian style. I keep there only rarities from artists… So I think maybe in summer I will be ready to open a kind of small Ukrainian culture center there. The Studio of Iryna Bilay is next to the State Museum of Toys. Only three floors of the same building separate them. A hall in the museum is devoted to the Ukrainian national toy. Several showcases in the center of the hall exhibit new and ancient straw works. Some of them where once made by the first students of the artist. — This very rooster was made by my daughter when she was in the 6th grade of her school. Now she is a student and we found this rooster in the museum accidentally. We sent it to some contest once and it was not returned, it happens, you know… And this horse has probably been here from 2000. These are the works of my first students. Do your first students continue with what was their childish passion? Certainly. For example, I have two students who work now in the Center of children’s art as heads of different studios and clubs – they are Lusya and Olena Synytsyny, two sisters. So the straw works live much longer than one year! They are very long-lasting things. A hat can last for forty years and it will only become darker in color. But it doesn’t lose anything from that and on the contrary it gets a new life with this new beautiful color. Would you tell us how to keep the things made from straw for them not to lose their properties? There are no special rules. They can even be washed because they are not afraid of it. It’s only that we sometimes make curls from straw and the curls are afraid of water because they can untwist.